It is now possible to skip forward / backward in the song with the pattern navigation keyboard shortcuts and scroll wheel during playback if "follow song" is enabled. ID3v2.4 tags were malformed in OpenMPT 1.25.03.00, leading to the first audio frame being skipped when playing the exported MP3 file. If you make use of OpenMPT's MP3 export, you are strongly advised to upgrade. The plugin gain control in the General tab was not accessible to screen readers. Recording MIDI CCs from MIDI was broken in MPTM files since OpenMPT 1.25.01.00. 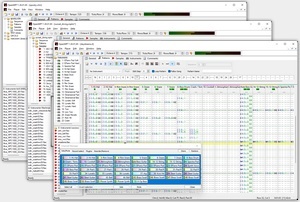 Opening the MIDI Mapping Dialog from a bridged plugin GUI could freeze the tracker. Global time signature values exceeding 255 rows were not loaded (but saved) correctly. Support for a few more MOD variants (CD61, FA04, FA06, FA08, NSMS and LARD magic bytes). Fixed a few more crashes and hangs encountered in AMF, IMF and MT2 loaders (detected with afl). Some MOD files were erroneously detected as 669 files. MIDI Learn in the MIDI Mapping Dialog did not work when opening the dialog from a plugin editor. Using key bindings in paths longer than 260 characters should now work properly. Disabling "Repeat notes on hold" for all notes at once was broken. By the way, we are still looking for new example songs to ship with the tracker. If you are interested, grab the samples found in the installation directory under ExampleSongs\Samples and use them to create a song, following the rules from the example song compo! New version... I guess you might have heard this a zillion times before... Hope its not too offtopic...? But anyway.. Will there ever be a nice looking GUI? All the hoards of ppl on pouet would probably stand in line to beautify the tracker, with a optional GUI, if it would happen.. Most ppl i know likes that there is progress with openmpt, but finds it just too ugly visually. Its a pity because its really extremely powerful under the hood. Most people will never know. It has not been a huge attractor this far unfortunately. And at the meantime more and more work will go in to the things that mostly the already converted will be amazed by. The insistence on the ugly GUI was also what scared new users away from Milkytracker earlier. And a buggy craptracker (sorry but i hated when it crashed in both win and linux repeatedly) like Skaletracker was popular just because it was pretty. The cleanest GUI that comes to mind that does not look to alien compared with openmpt for me is the open sourced protrekkr https://www.youtube.com/watch?v=rXXsZfvvgiI (Look in real HD) Not as good as OpenMPT but really intuitive and pleasing to the eye. I hope this post will not cause anger, that is not my wish at all. OpenMPT being "ugly" and requiring a "nice GUI" is purely subjective. I like OpenMPT exactly for what it is and having a standardized, familiar interface is one of its strongest selling points IMO. Want OpenMPT to have a dark UI? Then why is it only OpenMPT and not the rest of your operating system? Use a darker operating system skin! In addition, even if I wanted to make it skinnable, it's just too much work with MFC. Qt supposedly makes this easier so if/when we switch to a cross-platform GUI toolkit, there might be skinning capabilities provided by that framework. But don't ask me when that is going to happen. Thank you for reply. A dark skin in MPT would be sweet as pie. It does not feel like an appealing idea with a dark skin for every piece of software in the entire OS however. Yeah, I've read at the forum that MFC would not go down well with skinning... QT is great for many other reasons too as you mention. Hope some QT-wizards/linux geeks would find interest in helping with MPT since that would open up a lot of interesting new potential. This is simply not possible. SID files are not modules, they are binary code. SID files cannot be converted back to modules for editing, if you want to edit them you need to find the original file that was used to generate the SID file (e.g. a GoatTracker module). Even if SID files were modules, OpenMPT could not support them because we only support sample-based modules, not modules that make use of hardware synthesizers like the SID or OPL chips. If you merely want to listen to SID music, there are plenty of SID plugins for all popular audio players. I've been wondering whether "translating" my tracks to a streaming graphic composition of still pictures and video - hence video clip - would be possible within MPT or through any external VJ or video editing software out there. I'd apreciate it any kind of response on this matter. BTW, I've been using extensively MPT in its original oliver version for over a decade and thanks to preserving that old school magnificent GUI I could finally convert into an open MPT very content user. However, creating visuals for VJs is outside of the scope of OpenMPT and thus will never be a feature of the tracker itself. Made me think what I might be looking for is some plugin that would translate my exported MPT midi file into a set of commands some video editing progarm(eg.Cell) would recieve and execute. Know of any sort of thing? BTW: took a look into Radium but it wasn't my direction(also as a music editor seemed unprofessional compared to MPT). What I realy fantisize of is making some AVI/JPEG/etc files dance to my beat.